The Spirit of Sacrifice, aka The Alamo Cenotaph, Alamo Plaza in San Antonio, Texas. From the Greek words kenos, (empty) and taphos, (tomb) - cenotaphs are tombs or monuments erected to honor a person or persons whose remains are elsewhere or their whereabouts unknown. Quite frequently cenotaphs are erected for soldiers killed in distant places or sailors lost at sea. Texas has many such empty tombs, some of them modest tombstones in humble cemeteries. This one in San Antonio's Alamo Plaza is sometimes referred to as "The" Cenotaph. The west side of the base showing the figures of Travis and others that appear in two photos below. 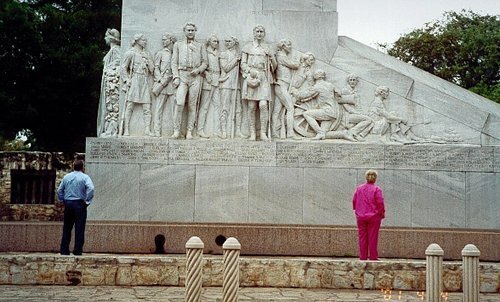 Figure of woman facing north (far left with garland) symbolizes the state of Texas. The base of the sculpture is 12 feet by 40 feet and it rises to a height of 60 feet. While Coppini had preferred to show the men in battle - the cenotaph had been designed by Carlton Adams before Coppini was chosen as sculptor. 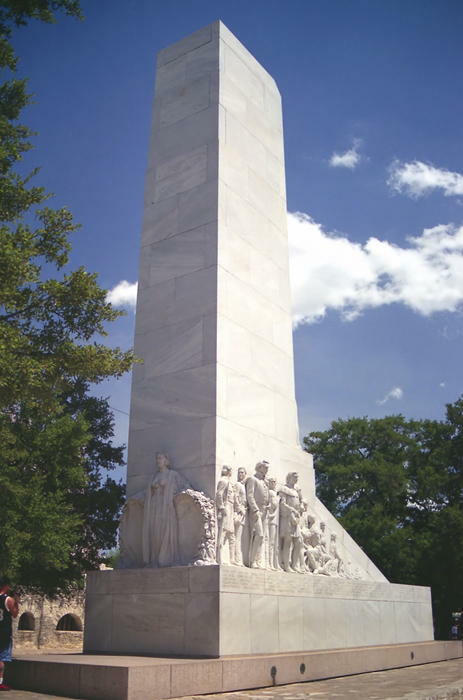 Some believe that the monument is built where many of the Alamo defenders were put to death after the fall. Others believe the corpses of the dead defenders were piled here and unceremoniously burned. In actuality, the location was chosen because Alamo Plaza was the only only space available near the Alamo, and the bandstand occupied Plaza de Valero. The funeral pyres were near the Alameda. 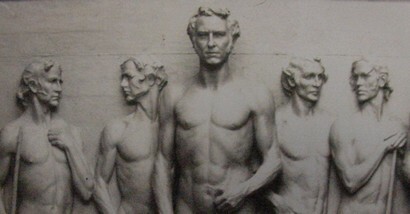 In a newspaper article, writer J. Frank Dobie compared the piece to a grain elevator - and even Coppini agreed with Dobie that the figures looked as though they were assembling for a portrait. Another Coppini work - a bas-relief over main entrance of a building two blocks north of Alamo square. The Cenotaph was one of the largest works of famed Italian-born sculptor Pompeo Coppini whose other works include statues in Ballinger, Galveston, Gonzales, Victoria, Austin and at least four more pieces in San Antonio - including his own elaborate tombstone. Three other Coppini works can be found within walking distance of the Cenotaph - one over the doorway of the old San Antonio News Office and two huge bronze doors on the Scottish Rite building just a few blocks north of the Alamo. The Texas Collection of Baylor University has a large file on Coppini and his "adopted" daughter - Waldine Tauch. 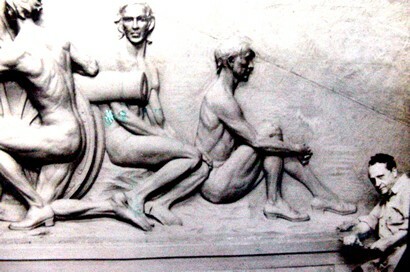 Within the file are photos of Coppini at work on the cenotaph figures. As you can see in these photos - he went to extraordinary lengths, even working on the musculature of the figures - even before adding the clothing. The figures on the far right of the west side. Pompeo Coppini at work. The figures on the west side as they appeared in clay. The same figures after being "clothed." 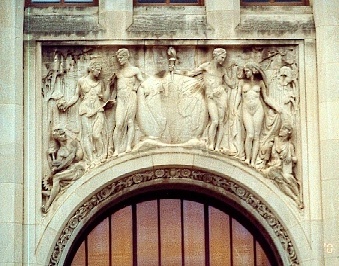 The south side of the main shaft has the 25-foot bas-relief figure - Spirit of Sacrifice - and the north face has a female figure representing Texas. 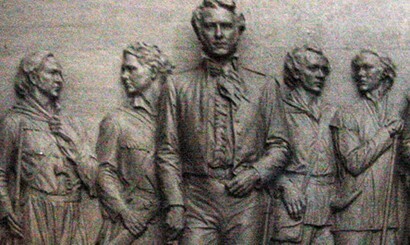 The east and west faces have larger-than-life statues of various Alamo defenders. Bowie and Bonham on the east face and Travis and Crockett on the west face. Erected in Memory of the Heroes who sacrificed their lives at the Alamo, March 6, 1836 in the defense of Texas, "They chose never to surrender nor retreat, these brave hearts with flag still proudly waving perished in the flames of immortality that their high sacrifice might lead to the founding on this Texas."